Every once in a while I go on a TED Talk or YouTube binge. Not really a binge, more like an immersion into new concepts, ideas, thinking, and people to read more of and about. Once on the TED or YouTube sites, I search for topics or peruse the lists of additional videos that are visible on the side or below the one I am viewing. I subscribe to TED Talks, so I get the talks of the week in my email in box. Some weeks I am not tempted to watch any of the highlighted ones, and sometimes I watch them all. It all depends on my available time, interest, and willingness to while away several hours in the pursuit of learning. Today was a rainy day, perfect for this kind of activity. The TED Talk that caught my attention from the get go is entitled: What happened when I open-sourced my brain cancer. The artist Salvatore Iaconesi was diagnosed with brain cancer. Instead of continuing with recommended treatment, he decided to create a web site, La Cura (Italian for the cure), put his scans and medical information online, and ask for help healing his whole body, mind, and spirit from those in cyberspace. His site went viral, he received advice from neurosurgeons, oncologists, artists, musicians, regular people. With their help, he formulated his treatment plan, found the surgeon and hospital he used, and changed his lifestyle. has extensive experience in the areas of strategic design, expert and decision support systems, knowledge management and sharing systems, technological platforms for multicultural communities, ubiquitous technologies, interactive experiences and innovation processes. In other words, he is net smart. His decision to utilize his expertise to reach out for help with his disease is unique, as is the outcome. I found his process an inspiring use of online networks – not just to learn with others, get advice, but also to change the concept of what a cure is and can be. Others are using online networks for imaginative uses that are often unexpected. In this short video from Inc.com, On the right way to think about networking, Beth Marcus, co-founder of a children’s app company Playrific, found that creating a marketing network for her company also created a network for other purposes as well, including selling her father’s dental practice. In my blog from February 10, 2015, I outlined the 5 tech trends to pay attention to for organizations. The tech trends were predicated on creating networks of organization champions, volunteers, and funders. In November, Doris blogged about Sighting Leadership Networks in Action. Using networks for change is not new – community organizers have been utilizing networks for a very long time. Major changes in our society have been a result of these organizers on a local, regional, and national level. The right for women to vote and the civil rights movements are two examples of this. In today’s world, organizing for change can happen much more quickly because of social media. In my blog Contextual Intelligence, the Culture of Generosity, and Us I cite Cognitive Surplus by Clay Shirky who gives examples of how networking can bring change to the common good (think Ushahidi.com). Here are some other examples of networks changing the global conversation about failure and success, unequal distribution of wealth, and other issues, just as Salvatore Iaconesi changed the conversation about what a cure is and means. Fear of failure, and fear of admitting to failure, was the basis of networking events that now span the globe. A group of entrepreneurs and friends including Leticia Gasca in Mexico City, after some glasses of mescal, started to talk about the failures they had experienced in starting their various ventures. “We realized that we had all fucked up businesses in the past but had never shared those stories, despite being really close friends.” Once the sharing process began, it went on for several hours. The article in the Stanford Social Innovation Review from the summer 2015 edition describes how the group utilized a modified PechaKucha Night format from Japan to help participants tell their stories of mistakes, misdirections, and failures. They used social media to publicize their Fuckup Nights, and through social media others around the globe took notice and asked to replicate their model. 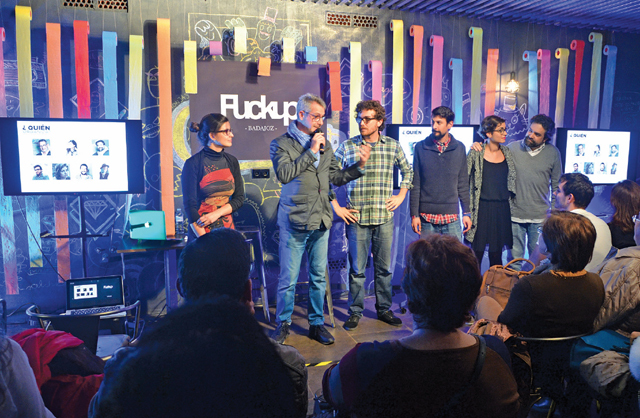 By March 2015, Fuckup Nights organizers had held gatherings in more than 100 cities worldwide, and send videos and slide shows of their events to the Fuckup Nights web site to be shared globally. “The idea is to have all of these failure stories in the same place, available to anyone on the planet,” Gasca says. A small group of friends, using the networking powers of social media and a web site, sowed the seeds for a global conversation on failure and success. Networking for change can have lasting results. The Occupy Wall Street movement is an example of this. There are two recent articles that examine the impact of this global movement, even after all the protesters are gone from the parks they occupied on Wall Street in New York City. Social media makes it easier and cheaper to build movements quickly – but bypassing the business of creating decision-making infrastructure means they can disappear just as fast. The Turkish-American sociologist Zeynep Tufekci has rightly noted that “these huge mobilisations of citizens inexplicably wither away without the impact on policy you might expect from their scale”. She explains the paradox well: it’s much easier to pull off spectacular events with digital technologies than to knit together lasting organisations. And it’s also easy to mistake the former for the latter. Despite the disbanding of protests and perhaps the Occupy movement, both articles highlight the changes in global conversations the protests engendered not just in the United States, but around the globe as Occupy groups spread to cities across the world. The actions and messages of Occupy groups around the globe still resonate. Perhaps Zeynep Tufekci is incorrect, and that the digital footprints these socially networked groups leave obviates the necessity for the continuance of a specific organization. We are all familiar with the African proverb, “it takes a village to raise a child”. In the new connected age, the proverb for change may be, “it takes an online network to raise the issues and do something about it” with or without an organizational structure.